If you live in Arizona, dialing the number 2-1-1 transfers you to a human who can help you in a time of crisis. The operators will let you know what resources are available to you, whether you need help paying bills, finding clothes and shelter, getting medical care, or referring you to a rehab center in the case of an addiction. It’s really a valuable service that functions on a barebones budget of $300,000. There are only three operators, down from 19 at its peak. And yet a Christian lobbying group known as the Center for Arizona Policy is threatening to get in the way of a funding bill that would appropriate $1.5 million to the program. Why? Because, out of the nearly 1 million calls Arizona’s 2-1-1 received last year, three of them asked for information about how to obtain an abortion… and the operators gave them the information they requested. And that makes the Baby Jesus cry. CAP’s director, Cathi Herrod, says her group won’t support the bill unless it’s amended to block operators from helping women seeking abortion services. “Longstanding public policy in Arizona promotes life. That policy prohibits any taxpayer funding of abortion,” CAP Director Cathi Herrod said in a statement to the Mirror. 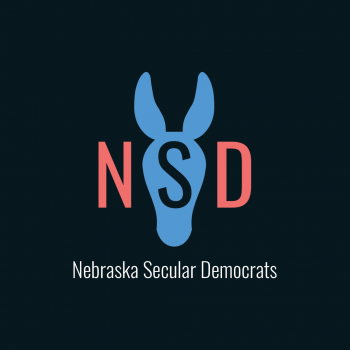 The group has proposed an amendment to the law that would disallow the service to include abortion providers. “The amendment, similar to other Arizona laws, would ensure that taxpayer funding for the 211 system would not include providing information regarding or referrals for abortions or to entities that provide abortions,” Herrod said. Herod is the driving force behind the Legislature’s continued efforts to make abortion more difficult and the court’s continued rulings to throw out many of those laws. She was a major player in the drive to create a universal school voucher program — the one that voters essentially vetoed. She made sure the Equal Rights Amendment was a no-go at the Legislature this year and she’s right there on the front lines any time there’s talk of outlawing discrimination based upon sexual orientation or gender identity. Pretty much what she says goes in this state. So if Herrod isn’t happy with 2-1-1, its chances of funding being restored are essentially zilch. Strike that. It’s chances are zilch without her OK.
It’s absurd when you realize what Herrod is doing. She’s so “pro-life” that she’ll gladly shut down a resource for women seeking help from domestic violence because she believes she’s protecting three fetuses. So what if thousands upon thousands of citizens suffer? They’re expendable. But fetuses are magic. Just like Jesus said. The sensible thing for Arizona lawmakers to do would be to ignore Herrod’s heartless threats and support the funding bill for a comprehensive program that offers so many benefits to people in the state. 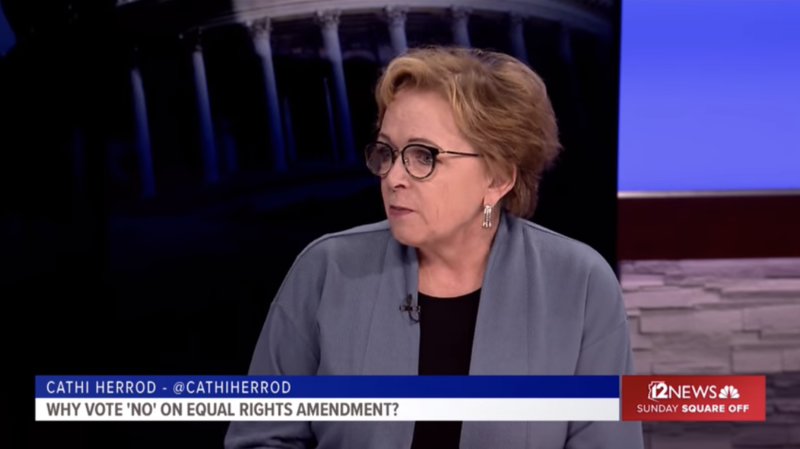 Instead, because they’re afraid of the Christian Right, they may very well cave in and amend the bill so that women can’t get help if Cathi Herrod doesn’t like their request. 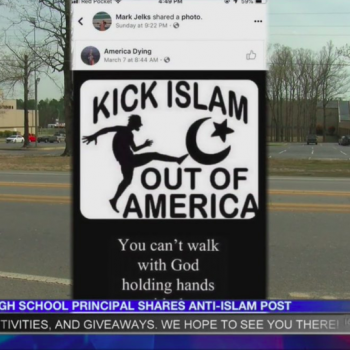 March 31, 2019 Arkansas Principal Shares Image on Facebook Saying "Kick Islam Out of America"